A locally made web series about butch lesbians makes its way to Frameline39, San Francisco's International LGBTQ film festival, after overcoming financial obstacles. 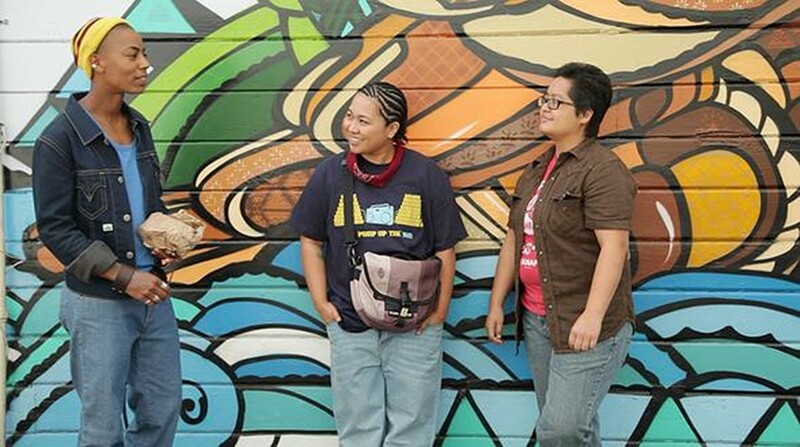 Mahasin Munir (L), Giovannie Espiritu, and Therese Garcia (R) star in Dyke Central. Dyke Central will be screening at San Francisco's Victoria Theatre (2961 16th St.) on June 20 at 4 p.m. ($10 general admission) and at Oakland's Piedmont Theatre (4186 Piedmont Ave.) on June 24 at 9:30 p.m. ($12 general admission). Tickets available at Frameline.org. 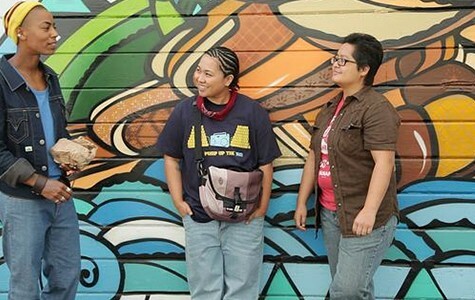 The team behind Dyke Central encountered a number of issues while creating its web series. "Well, you know, there was that time we got robbed at gunpoint," recalled actress Mahasin Munir, in a recent interview. "But we kept going, and it's been great." Such is the resiliency of the group that created the delightfully funny online show that is as much about the queer community in Oakland as it is about the city itself. And the commitment has paid off, because episodes six through ten will be soon be screened as part of Frameline39, San Francisco's annual international LGBTQ film festival. The festival exhibition will mark the end of a four-year-long journey to complete the show's first season, the first two episodes of which can be streamed for free on YouTube. Though rewarding, the ride wasn't always easy. There was the aforementioned robbery that resulted in an estimated $30,000 worth of lost equipment, the resignation of a castmember, and even the departure of one of the show's co-creators. Yet Dyke Central team members championed on, partially because they knew that they were creating something special, and partially because they had a dedicated community rallying behind them. The show chronicles the lives of lesbian roommates Gin (played by Giovannie Espiritu), a butch bed-hopper, Alex (played by Tai Rockett), a masculine-of-center sweetheart and their crew of LGBTQ-identifying friends. Among their cohorts are Zack (played by Tom Paul), a transgender man who offers sage relationship advice, Sol (played by Munir), an aspiring DJ with a sharp tongue, and Molly (played by Amelia Mae Paradise), a femme lesbian who likes to challenge stereotypical feminine norms by donning a blonde goatee. The diverse crew seems to struggle with the same issues many thirty-something urbanites face: forging relationships, falling in love, and finding good coffee. Dykes is more like a multicultural Oakland remix of Friends — complete with a group hangout spot — than LGBTQ shows such as The L Word and Queer as Folk. The bonds and friendships the characters share are the focal point of each episode, not their sexual escapades (though there are plenty of those, too). "Everybody has seen (The L Word and Queer as Folk)," said Paul. "There's an underrepresentation of transgender people, and people of color. When they are promoted in those shows, it's sort of fetishized. It isn't what the real community looks like." For director, writer, and producer Florencia Manovil, authentic representations of Oakland and its diverse queer community were of upmost importance. She strived to create a show about Oakland queers crafted by Oakland queers, hoping more communities and, by extension, the city, would embrace its narrative. "I want people to see that queer life in the Bay Area is awesome," said Manovil. "When we can be free to be who we are, and to celebrate it, our stories don't have to be tragic or wrapped up in oppression or not fitting into society. We have examples of LGBTQ people [who] are thriving — without needing to conceal or betray their queerness — in all sectors of society." But realizing the web series' full potential required money, especially because Manovil is dedicated to paying her cast and crew. For a few of the actors, this project has been the first time that they've received payment for acting roles, despite having extensive performing arts resumes. "You don't get that many opportunities as a queer artist of color to get paid for your work," explained Rockett. In most cases, the money just isn't available. So the team launched grassroots fundraising campaigns, which included using social media to raise awareness for the series. Ticket sales from a packed screening of the pilot at Grand Lake Theater in 2011 helped, but it wasn't enough to meet the cost of production for the planned ten-episode season. A few castmembers used their day jobs to stir up publicity, including Munir, who spread the word at Arizmendi cooperative bakery. Other local businesses helped, as well, offering cost-free settings as shooting locations. As a result, some episodes are like a "Where's Waldo" of Oakland hotspots. Feelmore510, Portal, the now extinct Good Bellies cafe, the White Horse and the Marsh are all prominently featured in the series. "We've been so gifted with locations," said Munir, adding that the show also gives back by representing the community. "If there are people out there who want their art in the show, their music in the show, their restaurant in the show ... that's some of the things we promote. We promote Oakland culture as a whole." Despite the outpouring of community support, however, Manovil still had to take out loans. And when the cast was robbed, the likelihood of finishing the first season seemed doubtful at best. The cast and crew were incensed, but they didn't give up. "It was vital for them to feel that the robbers wouldn't win," said Manovil. "We wouldn't let our project be sabotaged." That's when Frameline stepped in. The media arts nonprofit granted Manovil an endowment from its Completion Fund, which offers financial assistance to filmmakers with big ideas but small budgets. Dyke Central is the only web series to be awarded with the grant in the nonprofit's history. This will be the third year that episodes from the series will be screened as part of the annual festival, which is the biggest and most widely recognized of its kind. Manovil will be one of several Oakland filmmakers whose work is featured in the prestigious lineup. Though Manovil hasn't started production on season two, she, like the cast, remains hopeful that it could happen. "It takes time," she said. UC Berkeley senior Summer Mason challenges the film department to better represent minority perspectives.